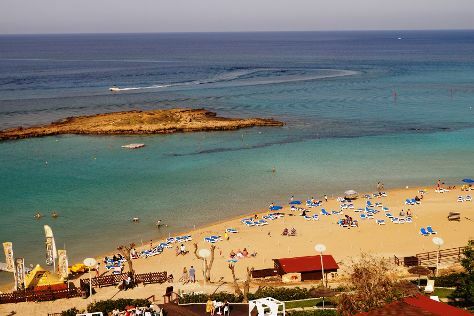 Located along Cyprus's lovely Fig Tree Bay, Protaras is a family-friendly resort town with beautiful beaches and plenty of recreational activities. Visitors come to explore the town's hotels, bars, shops, and restaurants, including outdoor venues with fresh seafood. Swim in the sea or one of the area's many pools, play in the sand, bike along the shore, or stroll well-paved trails. Though it may be a sleepy place compared to other historical Cypriot cities, Protaras has made a name for itself as a child-friendly destination. Protaras is in Paralimni. Make Protaras central to your Cyprus travel plans using our Cyprus trip builder site . Although a compact city, Protaras offers a wide range of hotels. Luxury hotels tend to be close to the picturesque beaches and offer their own restaurants, bars, and swimming pools. Holiday rentals offer a more economical option and are plentiful here. However, those interested in a large villas may have to compromise on location, as these can be a considerable distance from the seaside and the resort's most popular attractions. But when your accommodations is equipped with a kitchen, pool, and hot tub, you may have little reason to leave the property.